Mary Schreiber is youth collection development specialist at Cuyahoga County Public Library, Parma, OH. Schreiber, Mary. 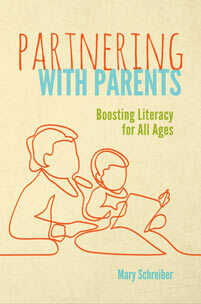 Partnering with Parents: Boosting Literacy for All Ages. Libraries Unlimited, 2019. ABC-CLIO, publisher.abc-clio.com/9781440863936. Caregiver involvement is key to a child's reading success story, and libraries are in the perfect position to provide the guidance needed for parents and caregivers to embrace their role as their children's first and most enduring teachers.